On some Windows machines pip has a problem caused by spaces in the Python installation path. Note: replace tweepy with the Python package you are trying to install. You will not receive the same output as in this example tweepy is already install via pip! #ifdef, #ifndef is name defined, not defined? isgraph(c) printing character (not including space)? isprint(c) Printing Character (Including space)? ispunct(c) Printing Character except space, letter, digit? isspace(c) space, formfeed, newline, cr, tab, vtab? For quick compiling of C/C++ programs on a Windows PC, the Visual C++ 2015 Command Prompt is your go to program. Many programs have no need for development in an IDE. 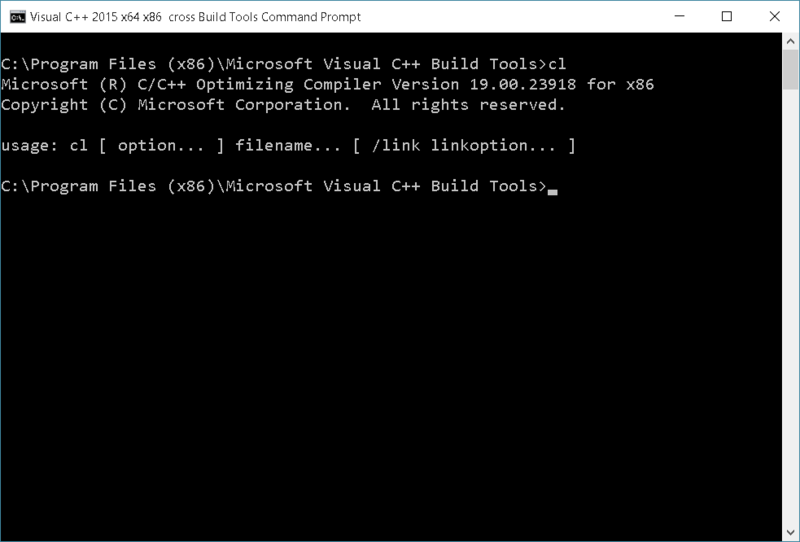 Before you can compile a c/c++ program you will need to install the Microsoft Visual C++ Build Tools 2015. Once installed you will have a new list of shortcuts in your Start Menu. If you right click on any one of the Visual C++ 2015 Programs and choose Open File Location you will also see the extensive list of tools. To verify that the prompt is functioning property, type cl and the prompt will output the exact same information again. 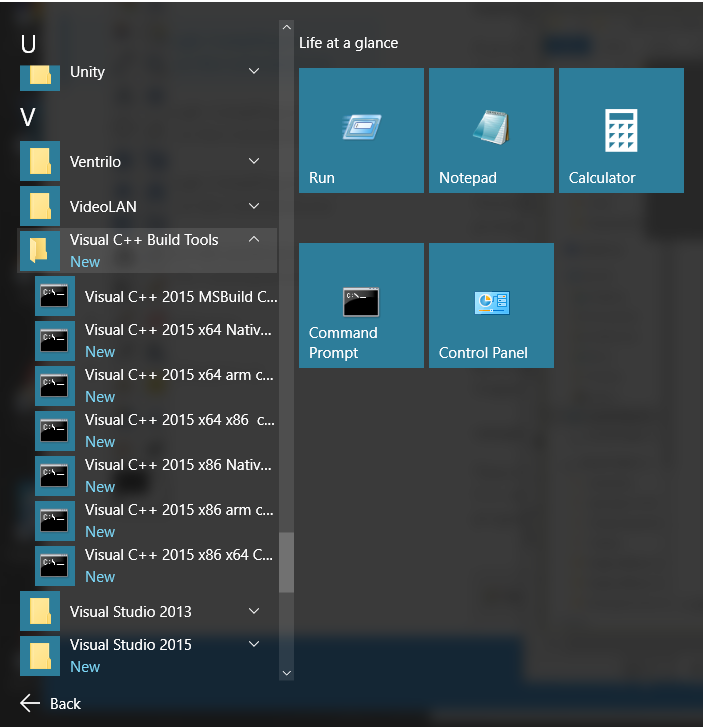 Note: You can use the Visual C++ 2015 Build Tools Command Prompt the same way you would use the standard command prompt for directory navigation. To test a simple C program, first create a test directory to hold your test program. md c:\test to create a directory, and then enter cd c:\test to change to that directory. This is where your source files and executable will be stored. Type notepad test.c When the Notepad alert dialog pops up, choose Yes to create the new test.c file in your current working directory. To run your newly compiled program simply type test and your program will run in the command prompt. You can also double click the test.exe executable. Fire up your favorite ftp client and connect to your WordPress site. Navigate to wp-config.php which will be in your web site root www folder by default. Save and re upload the wp-config.php file. Now Editor should be back in your Appearance menu. If not refresh the page. considered to be in week 0. W Week of year ( 1 to 53) //Week that overlaps two years belongs to the year that contains the most days of that week. date(“W”, mktime(0,0,0,12,8,$year)) always gives correct number of weeks in $year. The Arduino was introduced in 2005 by founders Massimo Banzi, David Cuartielles, Tom Igoe, Gianluca Martino, and David Mellis. The Arduino is not really the board itself or the microprocessor on the board. The Arduino is a hardware/software platform that was designed to provide an inexpensive and easy way for hobbyists, students and professionals to create devices that interact with their environment. The Arduino platform is completely open hardware and open source software. The Arduino platform is a single-board microcontroller designed around an 8-bit Atmel AVR microcontroller, or a 32-bit Atmel ARM. Official Arduinos have used the megaAVR series of chips, specifically the ATmega8, ATmega168, ATmega328, ATmega1280, and ATmega2560. Most boards include a 5 volt linear regulator and a 16 MHz crystal oscillator. The Arduino Platform comes with a simple down-loadable, cross-platform, integrated development environment (IDE) written in JAVA and allows users to write programs for Arduino using C or C++. The code you write is C/C++ syntax but not a valid C/C++ program. An extra include header at the top and a very simple main() function at the bottom, to make it a valid C++ program. The IDE is derived from the IDE for the Processing programming language and the Wiring development platform and contains a C/C++ library called “Wiring”. Wiring was based on the original work done on Processing project in MIT. The Wiring IDE uses the GNU toolchain and AVR Libc to compile programs, and uses avrdude to upload programs to the board. You can program the arduino in standard C using avrstudio and upload with avrdude. Turns on an LED on for one second, then off for one second, repeatedly. // Pin 13 has an LED connected on most Arduino boards. // initialize the digital pin as an output. We have hundreds of tutorials in mind for the Arduino Developemnt Platform. We will begin to produce them soon so keep checking back. For more information right now, check out the offical Arduino page at https://arduino.cc be sure to check out the Arduino playground which has tons of information to get you started.